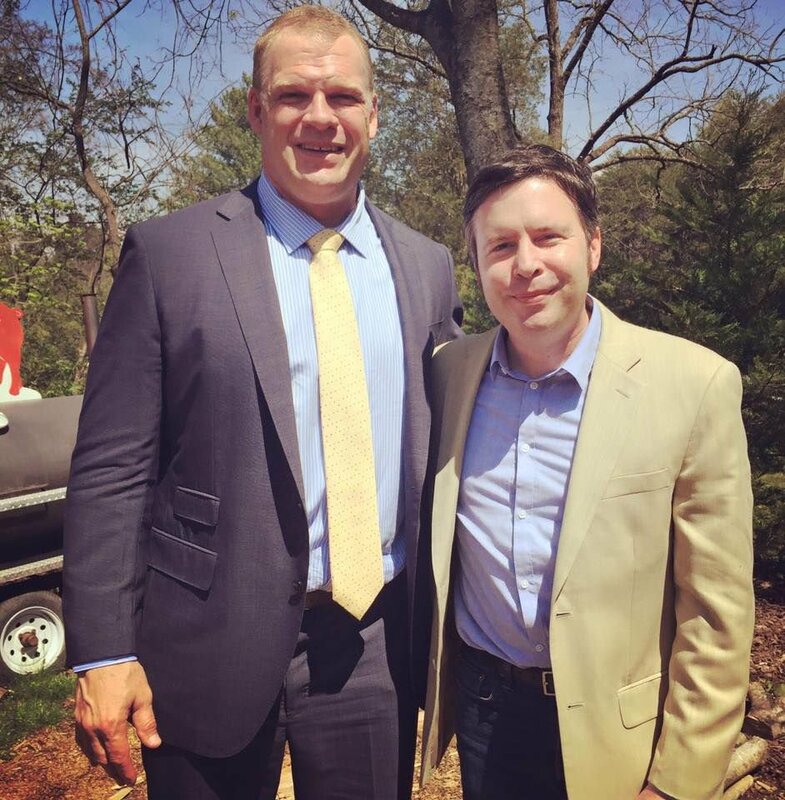 With a WWE Hall of Famer in the White House and a fellow honoree seeking the top job in the nation’s fourth-largest city, another WWE superstar is looking to make his mark in East Tennessee. Glenn Jacobs, better known to wrestling fans worldwide as the “The Red Monster” Kane, is trading in the wrestling ring for the political arena. Jacobs is the second WWE star to announce his mayoral candidacy in recent months. Hall of Famer Booker Huffman (aka Booker T) announced in December that he was running for mayor of Houston. Jacobs, a 25-year veteran of the mat wars, on Tuesday announced the beginning of his campaign to run for mayor of Knox County, which includes Knoxville and its suburban sprawl. A noted libertarian activist, Jacobs is running as a Republican. He and his wife Crystal own an insurance agency in the Knoxville area. The Jacobs family has lived in East Tennessee since 1995, and moved to Knoxville several years ago. “This is a great place to work, live and raise a family. I want to do my part to make sure it remains a great place and that our future is as bright as ever,” Jacobs told the crowd. Politically savvy and an extremely articulate spokesman for his cause, Jacobs said he would work to make Knox County an attractive place for new businesses and would work towards a “world class workforce.” He said he would implement talkback sessions to hear from constituents and wants to keep local government out of the way. A critic of big government and co-founder of the Tennessee Liberty Alliance, Jacobs focused on the themes of jobs, education and smaller government. Tea Party groups urged Jacobs to challenge U.S. Sen. Lamar Alexander in the Republican primary in 2014, but he ended up deciding against a run. Charleston native Jack Hunter, editor of Rare Politics and co-author of “The Tea Party Goes to Washington” with Sen. Rand Paul, is one of Jacobs’ biggest backers. “I’ve known him for over five years now. I’m a libertarian conservative obsessed with pro wrestling, and Glenn is one of the most well-known pro wrestlers in the world who is also a thoughtful and passionate libertarian conservative. We were probably bound to become friends at some point,” said Hunter. Jacobs, less than two weeks shy of his 50th birthday, is also an occasional contributor to Hunter’s conservative website. “Libertarian-leaning Republicans like my old boss Sen. Rand Paul and Sen. Mike Lee of Utah, Charleston’s Mark Sanford, House Freedom Caucus co-founder, Michigan Rep. Justin Amash, Rep. Thomas Massie of Kentucky, and South Carolina’s Mick Mulvaney, who is President Trump’s new budget director, these leaders represent a new breed of Republican who continue to be an impactful force within the GOP. Glenn Jacobs fits the same mold. It’s an exciting time for conservatives and libertarians,” said Hunter. Disillusioned with the two-party system, Jacobs said in a 2013 interview that the country needs a viable multi-party system. “If you look at election laws, they’re written by Republicans and Democrats,” said Jacobs. “They sort of hold a monopoly on the electoral system. Even the reform laws of the past several years are not designed to make the system fairer. They make things harder for people to challenge the status quo. Jacobs possesses a degree in literature from the former Northeast Missouri State University (now Truman State University) where he played both football and basketball. During the 1988-89 season he was an NCAA all-star and the single-season and career field goal percentage leader for his basketball team. Jacobs’ 22-year run on WWE’s main roster has seen him compile nearly 1,000 televised matches, and dozens more in additional stints as Isaac Yankem and the fake Diesel. The 6-9, 300-pound behemoth has racked up 18 titles, including three-time world champion and 12-time world tag-team champion. Jacobs debuted in the WWE (then the World Wrestling Federation) in the early 1990s as “evil dentist” Isaac Yankem. He made his WWE debut as the “Kane” character at the Badd Blood pay-per-view in October 1997 when he tore off the cage door during the company's first-ever Hell in a Cell match between Shawn Michaels and fictional half-brother The Undertaker. For years, the performer dubbed “The Devil’s Favorite Demon” wore a ghoulish mask designed to conceal what purportedly were hideous burns from a fire supposedly started by Undertaker years before. Since that time, his character took more twists and turns than a murder mystery, but Kane remained one of WWE’s most popular characters. Jacobs also dabbled in acting, having starred in the horror films “See No Evil” and its sequel. Pro wrestling and sports entertainment aside, Jacobs is very interested in the future of the country, and has always been vocal about the role of government in the lives of its citizens. Hunter says Jacobs is the real deal and more than capable of winning the election. “A wise man once said, ‘To be the man, you’ve got to beat the man.’ I hope Glenn’s opponents are ready,” said Hunter. Jacobs, who hasn’t been seen on WWE programming since last November, said his background as a wrestler has prepared him for a job in politics. Tim Burchett, the current mayor of Knox County, is ineligible to run in the next election because of the county’s term limits. Burchett became Knox County Mayor in September 2010. The election is scheduled May 1, 2018. Jacobs isn't the first professional wrestling star to try his hand at politics in Tennessee. WWE Hall of Famer Jerry “The King” Lawler has made unsuccessful bids to be elected mayor of Memphis. Huffman, who was inducted into the WWE Hall of Fame in 2013, cited his resiliency and love for his hometown as his main motivation for seeking the mayoral job in Houston. A Houston native, Huffman will challenge incumbent Mayor Sylvester Turner in the 2019 election.